The Old Salts have a limited supply of ‘NAVY’ & ‘NAVY VETERAN’ branded polo shirts and caps. ORDER YOURS NOW! No image available. Dark Navy Blue with gold logo (shirts) or white logo (caps only). All orders plus $7.50 P&H. Limited stock. Get in quick or miss out. Order by phone to ensure we have your required size available. 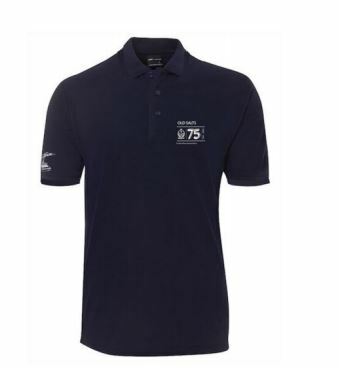 Dark Navy Blue (of course) with white Old Salts 75th logo on chest and William C Daldy logo on right sleeve. $15 each plus $7.50 P&H.